Love hummingbirds? I don’t know anyone who doesn’t! 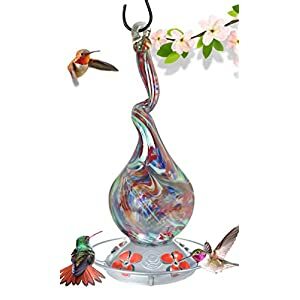 If you want to attract beautiful hummers to your yard, consider displaying glass hummingbird feeders loaded with their favorite sweet nectar. Hummingbirds are native to North and South America and are some of the smallest of birds. Most hummingbirds are around 7.5-13cm in length. However, the smallest species of hummingbird is the bee hummingbird and measures just about 5cm. It weighs less than 2 grams. Can you imagine that? Here he is, below. Beautiful!!! The easiest way to attract these adorable birdies to your yard is by adding a few glass hummingbird feeders around your flower garden. 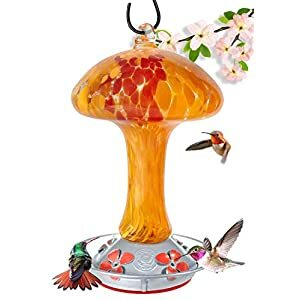 Hand Blown Glass Hummingbird Feeder – Red and Orange Mushroom If you live in an area that has hummingbirds, and it’s the right time of year, you can lure them out pretty easily with the right feeders. Some of us make a hobby out of collecting the feeders, displaying them outside, and attracting the hummers. We take pictures or recordings of the humming birds when they come to feed, too. 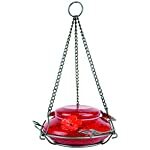 Whatever way you enjoy viewing your hummingbirds, you’re going to need some hanging feeders for your flower garden. 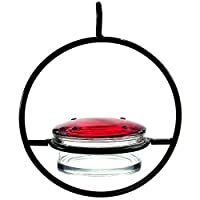 I have taken the time to compile my favorite glass hummingbird feeders so that you can see some of the best available out there to start your own collection. First up, some hand blown glass hummingbird feeders. I have always been amazed at the intricate details and beauty of hand-blown glass. It takes so much work and skill, versus something that is just made in a factory. I think you’ll be impressed with these as well. Hand blow glass hummingbird feeders come in many different shapes, styles and colors. Because of the way they are created, there are really no two that are ever exactly alike. Honestly, that’s another big benefit to them. You will have a handmade piece that is unique and a work of art. 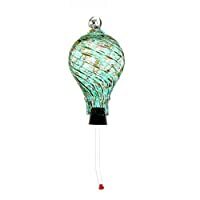 You can see some examples below of great hand blown glass hummingbird feeders. The range of colors and shapes are my favorite part. 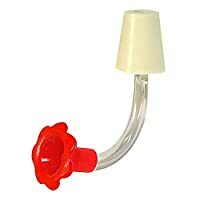 Apart from these intricate hand blow glass feeders, there is also the classic red hummingbird feeder. There are two reasons many hummingbird feeders are the color red. For one, the flowers that hummingbirds typically feed from are brightly colored, so the red will attract them to it more easily. Another reason is that hummingbirds see red more clearly than humans so they may be more easily drawn to your red feeders than those of a different color. 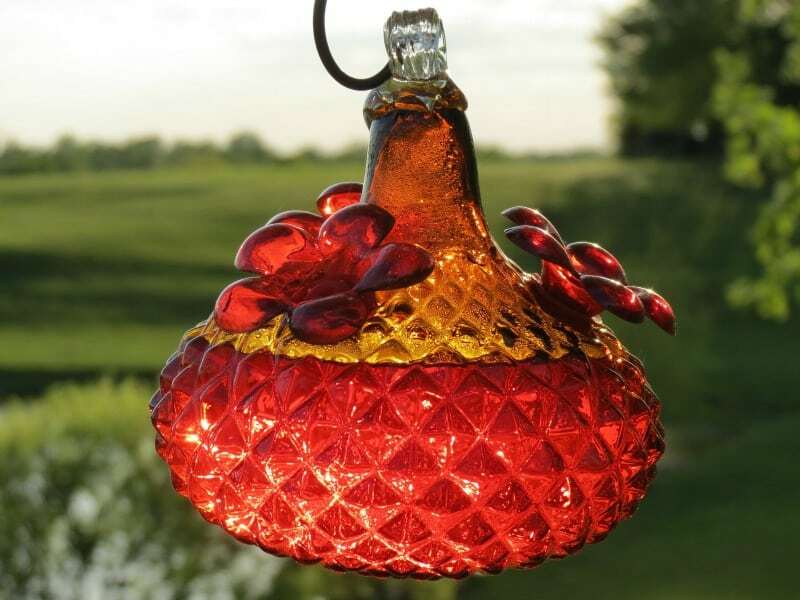 If you’re already using red glass hummingbird feeders, you may have heard that the birds are attracted to the red. It’s only partly true. They are attracted to bright colors, yes, but there is no proof that red specifically is a preferred color to them, apart from them being able to see it better. If you want to attract hummers to your yard or garden, you can do it with a variety of red – not just the red feeders. You can also plant red flowers, or use red benches and chairs. You can use red garden decorations like gazing balls and flags, too. 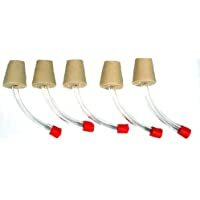 Taking a look at these red feeders though, I can see how they are so popular. 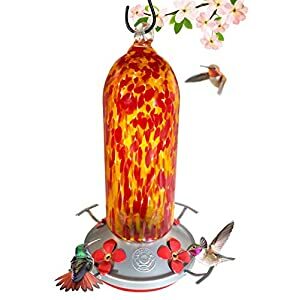 They are beautiful – ornate even – and they really do have the classic look and color of hummingbird feeders that most of us who grew up around them will remember from all of our lives. The most important thing to remember about using red to attract hummingbirds is that red dye is VERY dangerous for them. 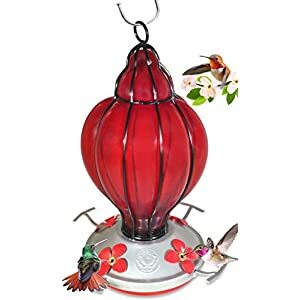 This was very popular in the past and nearly all hummingbird nectar you purchased was red but natural nectar is clear and adding the red dye could have lasting, damaging effects on the birds. Skip the dye and use a red feeder instead. 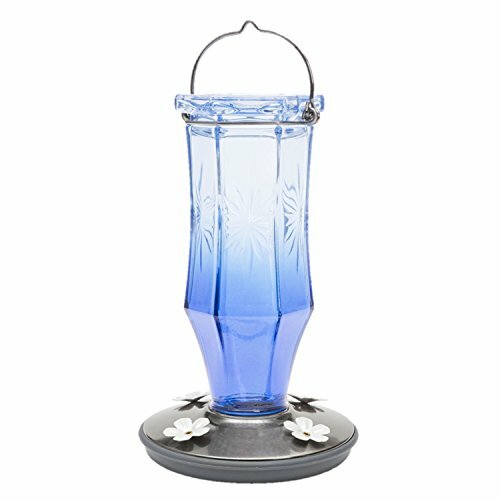 If red isn’t your color, or maybe you already have some red feeders and you want to try something different in the garden, take a look at this blue glass hummingbird feeder. I love it for the color as well as the design. 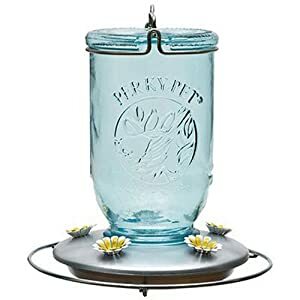 This would look lovely in any garden, or on your front porch hanging where you can see the birds out the window when they come to feed on sweet nectar from this beautiful feeder. Which brings me to another of my favorite types of glass feeders – stained glass! 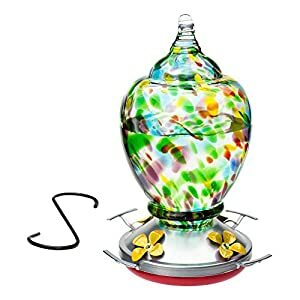 I absolutely adore the look of this stained glass hummingbird feeder. There are some that look just like church windows, and there are some with varied patterns, more modern designs, and interesting color combinations. But they’re all done with the same stained glass look and feel to them. 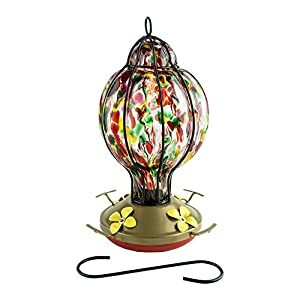 The birds will love these because they have so many pretty colors on them! Just like the flowers they are so naturally attracted to. 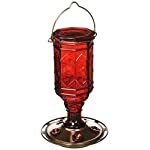 Gone are the days when you could only find one or two different styles of classic red hummingbird feeders. Now we have many great designs to choose from like the ones below. 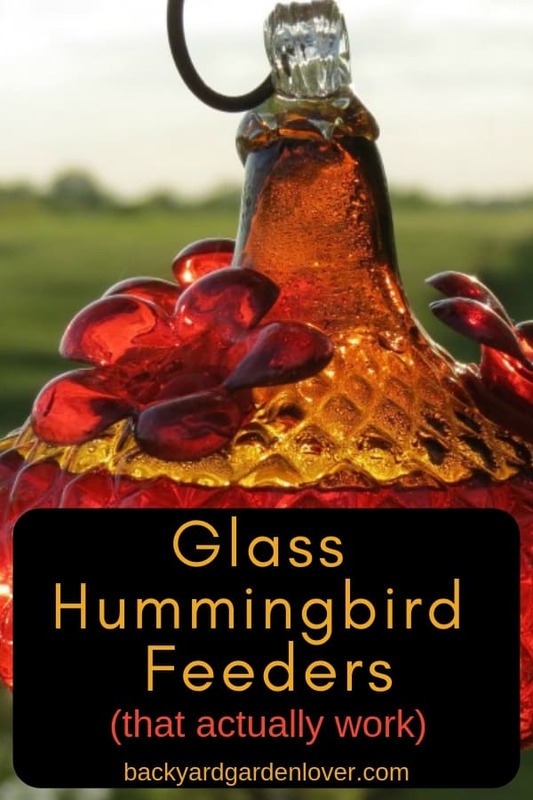 Here are some interesting decorative glass hummingbird feeders. I have chosen three very different ones so you get a good idea of what is available out there. Do some searching on your own: you will find there are almost limitless possibilities. 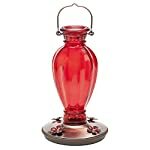 If you’re a big collector, you will love the many choices of decorative feeders out there for you. If you’re just looking for one or two feeders to add to your garden, then you will likely also appreciate that you have so many to choose from. Which brings us to another option. Should you get a hummingbird feeder with a perch? 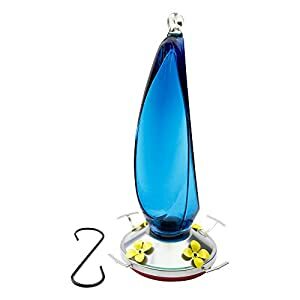 A glass hummingbird feeder with perch is another option that you may be considering. It is not a necessity because the birds can drink nectar while flying. However, some people like the look of the feeders with a perch, and if you have them available, some birds will perch while they feed. 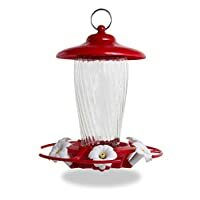 This can make it easier to get a picture if you’re into bird-watching and photographing your hummingbirds. 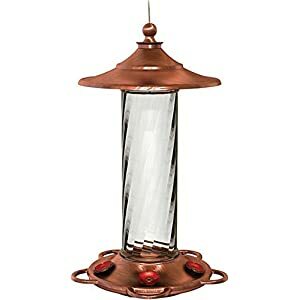 These are just a few pictures of my favorite hummingbird feeders with perches, but I’m sure you’d find even more if you did some digging around of your own. I especially like the blue one because it is so unique and has a bright blue color, almost like the sky on a sunny day. It also has the pretty yellow flowers on the bottom to attract the birds. 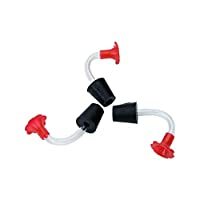 If you prefer making your own hummingbird feeders, you’ll need some of these hummingbird feeder tubes and stoppers. They are made to simulate the way the birds draw the nectar out of natural flowers. As you can see, there is no shortage of options for you when it comes to hummingbird feeders. There are glass feeders of all different shapes and sizes, colors and designs. There is sure to be something to meet your needs and tastes. They also make great gift ideas for someone you know who loves bird watching, or who has a garden or yard full of lovely flowers or other birdhouses. Did these ideas for glass feeders inspire you to get some of your own? Maybe you have some new ideas for your garden decor now. 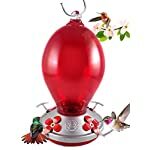 You’ll love the hummingbirds you start attracting with any of these great feeder options. Enjoy! Do you have replacement blossoms for this feeder?